"The strategy of the Frankfurt School was the reorganization of the American people into collectives or groups and putting the dialectical process into action within these groups. The entire plan was first laid out in 1951 in the how-to book, Human Relations and Curriculum Change. This was a selection of readings by various Hegelian Marxists that in its totality, provided a guide for the destruction of any and all of America’s existing traditional institutions by first destroying, group by group, each individual’s Christian conscience, and thus the Ultimate Authority in America. . . ."
-- Judy McLemore, Critical Theory Marxism, Dialectical Method and Total Quality Management, Vol. 3 (2nd ed. ), 2002, p3. 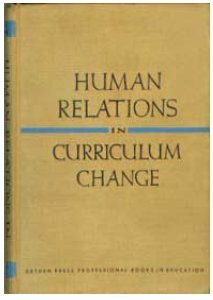 Human Relations in Curriculum Change (ed. Kenneth D. Benne & Bozidar Muntyan, 1951) contains valuable information -- key to recognizing the social engineering group processes used for preparing populations to live in an elite-controlled collectivist society. The [transformational Marxist] theory/practices in this book are peddled under the guise of supporting so-called "democratic" deliberation, "democratic" participation, and "democratic" cooperation, etc. Though it becomes clear that "democratic" whatever merely refers to the act of participating in a group, as well as engaging in what is identified as "group thinking." 1) Charlotte Iserbyt's "The Death of Free Will" (Dec. 2010, see pgs 2-3) cites where Human Relations in Curriculum Change fits in the context of the changes that were planned nearly a century ago. "The work of the National Training Laboratory in Group Development, sponsored by the National Education Association and the Research Center for Group Dynamics, University of Michigan, has helped to advance our understanding of group development in the interrelated contexts of training, research and social action. This latter work has built in some large part upon the frontier theorizing of Kurt Lewin and his associates." 3) Kurt Lewin is an important link between the National Training Labs (United States) and the Tavistock Institute (London). This is why similar social engineering processes are found in both the U.S. and U.K.
A Materials and Training Development Project. June 15-17, 1971, Washington, D. C.
Excerpt from Abstract: "This paper describes the science of managed change and how this technique can be applied to educational situations. It also points out current educational problems to which this science of change should be applied. . . ."
Excerpt (emphasis added): In its origins the T-Group is the principal tool of a particular form of education - the Human Relations Laboratory . . . Although he died shortly before the first Human Relations Laboratory, Kurt Lewin was the guiding light behind the development of the T-Group. . . .
Excerpt: The Tavistock method originated with the work of the British psychoanalyst Wilfred R. Bion. In the late 1940s, Bion conducted a series of small study groups at the Centre for Applied Social Research in London's Tavistock Institute of Human Relations. Bion's previous experience with military leadership training and the rehabilitation of psychiatric patients convinced him of the importance of considering not only the individual in treatment, but also the group of which the individual is a member. Schooled in the psychoanalytic tradition of Melanie Klein, Bion employed her innovative methods of direct, confrontive intervention while working with the study groups and reported his experiences in a series of articles for the journal Human Relations (1959). Later published in book form as Experiences in Groups (1961), this seminal work stimulated further experimentation at Tavistock and other locations with Bion's novel approach of "taking" a group and viewing it as a collective entity. Gradually, the approach evolved into a method. In 1957, the Tavistock Institute and the University of Leicester co-sponsored the first group relations conference, a two-week experiential learning event that focused on the roles that participants assume in work groups. Buttressed by Bion's theory, the conference design also showed the influence of Kurt Lewin and the experimental ideas of the National Training Laboratories in the United States. This first conference led to others. The transformational group processes found in Human Relations in Curriculum Change were used early on within the U.S. education system. They have since been applied to other sectors -- government, military, law enforcement, community development, churches, corporations, etc. -- and are being employed under the guise of leadership training, professional development, "problem solving," conflict resolution, (facilitated) consensus building, sensitivity training, Delphi, and many other labels. Through group activity, participants are processed for "group thinking" (a term used in Human Relations in Curriculum Change). Others have written about the applications of the group process (found in Human Relations in Curriculum Change) as applied to various sectors of society. -- see links below. The dialectical process put into praxis. Quotes and Excerpts: From Kurt Lewin: "Group Decision and Social Change"
Excerpt: "The intentional process of radical social change demands continual tension or crisis. These may be spontaneous or manufactured. This book helped lay the foundation for the psycho-social strategies that have transformed education and culture around the world. Based on the research begun at Tavistock (England), continued at the Frankfurt Institute (Germany) then moved to MIT, Columbia University, Stanford and various tax-funded "Educational Laboratories" after World War II, it established the strategies for brainwashing that now permeate our schools, media and organizations." Excerpt: "The intentional process of radical social change demands continual tension or crisis. These may be spontaneous or manufactured. This book helped lay the foundation for the psycho-social strategies that have transformed education and culture around the world. . . ."
Excerpt: Suppose we awakened one day and learned that members of our military, all of them from the highest ranking officer to the lowliest recruit, were being subjected to a process of thought control called ‘sensitivity training.’ And suppose that on further inquiry we learned that this harmless-sounding phrase in actuality describes a process of indoctrination that reaches into the furthest depths of one’s being. Furthermore, suppose you awakened from a long slumber and found that the same virus that has infected our 'multicultural' public schools (K-12), some of the nation's premiere business schools, and our active-duty military establishment had also taken root at a prize military education establishment, the U.S. Naval Academy. If so, would you not want to know more about this situation? Excerpt: Welcome to the world of behavior modification via a technique that has been perfected over the past 30 years – 'sensitivity training.' It is being used to overcome resistance to the lowering of standards in naval aviation to enable females to join the air combat arms of our military, including the manning of combat ships at sea. It is a technique developed steadily over the past fifty years that has proven successful in changing a person’s world view, that is, his or her values, fundamental beliefs, and even religious convictions. The [Midshipman's] essay is a classic example of Critical Theory straight out of the teachings of the "cultural Marxist" Frankfurt School. Excerpt: . . . suppose you were to learn that nearly all of the observations made in this series of essays are completely consistent with a 'design' -- that is a concept, a way of thinking, and a process for bringing it about. And suppose one could identify a small core group of people who designed just such a concept and thought through the process of infusing it into a culture. Wouldn't you be interested in at least learning about such a core group? Wouldn't you want to know who they were, what they thought, and how they conjured up a process for bringing their thoughts into action? For Americans with even a smidgeon of curiosity, the answer should be a resounding yes! Talk by former Royal Navy Officer Brian Gerrish, at the Bournemouth International Hotel in July 2008, updating his work exposing the political charity Common Purpose. The hour talk starts with a look at the disturbing art-work and signs of the police state now appearing across UK, as well as new material on Common Purpose. This includes Common Purpose's attack on those people daring to challenge its role in society. Audience questions are answered at the end of his talk. This presentation was given at Leicester, England in September 2007. MEP Rogert Helmer came specially to be there and guest host the meeting. Edward Spalton of the CIB (Campaign for an Independent Britain) gave a short introduction. The presentation was given by Brian Gerrish on his researches concerning Common Purpose. * Brian Gerish is a retired Lieutenant Commander, Royal Navy.